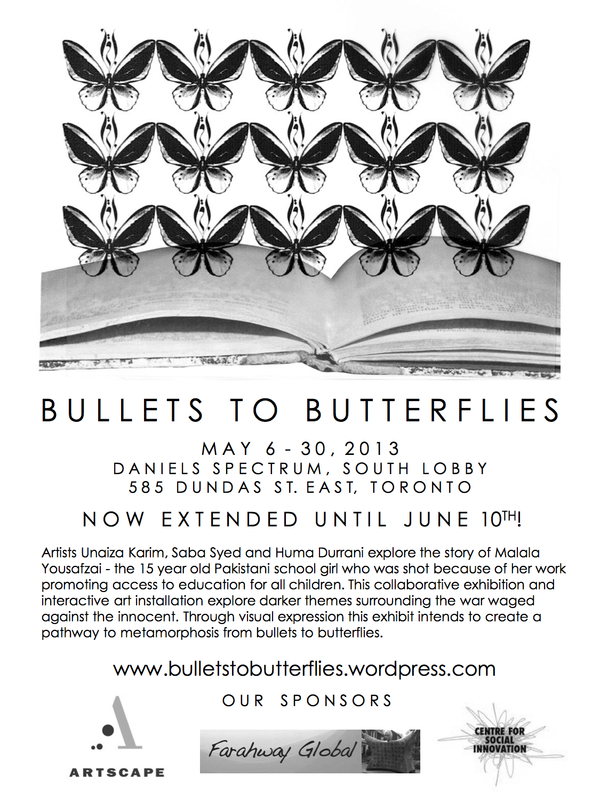 We are excited to announce that Farahway Global will be hosting Bullets to Butterflies, a collaborative exhibition and interactive art installation by Canadian artists Unaiza Karim, Saba Syed and Huma Durrani, focused on 15 year old education activist Malala Yousafzai. Like so many around the world, we are greatly inspired by Malala’s remarkable resilience in surviving an assassination attempt by Taliban gunmen, and her fearlessness in fighting for girls’ right to education. She has now become the youngest Nobel Peace Prize nominee in history. We need events such as Bullets to Butterflies to mark such horrific tragedies around the world and in our backyards, and transform them into hope and action for change for our communities, and especially for our children, and youth. At the very least, they deserve the opportunity to pursue their dreams. I hope you will join us in supporting, promoting, and participating in Bullets to Butterflies. RSVP and invite your friends on Facebook. Follow Bullets to Butterflies and Farahway Global on Twitter for updates and live tweeting. Tweet along with us using #B2Butterflies.